Volunteer – How Can I Help? The word “worship” has its original roots in the words “worth” and “value.” When Christians meet for worship, we are affirming and celebrating what we consider worth-while and valuable above all else—a saving relationship with God and his son Jesus Christ who teach us that a life grounded here and now in love and justice is the pathway to eternal life. At St. Paul United Church of Christ, we worship together on Sunday mornings and on many other days and occasions through-out the year. From the Sunday after Labor Day until the third Sunday in June, our Sunday morning services are at 9 and 10:30 a.m. Our summer Sunday services start at 9:30 a.m. For two weeks between Christmas and our congregation’s mid-January annual meeting, we also have a single Sunday worship service at 10 a.m. During the Lenten season our congregation has Wednesday evening services in the sanctuary at 7 p.m. Other special worship services are announced through our church’s monthly newsletter, The Tidings. We invite you to join with us for worship, celebrating what we all called to value most—a life in Jesus Christ. Christian worship is at the center of our church's life and ministry. Sometimes formal, other times informal, worship at St. Paul United Church of Christ blends fine sacred music, prayer, and biblically-grounded preaching into services of the Word that call our congregation to be God's people. Although our pastor presides at all worships services, members of our congregation participate each week in worship as readers, speakers, musicians, vocalists, communion servers, and ushers. In addition, a Worship Planning Team, composed of volunteers from the membership, meets monthly with the pastor to plan worship services. Congregational input is always welcomed. Please speak with the pastor or a member of the Worship Planning Team if you have worship suggestions or recommendations to share. Sunday morning services, September through June, are at 9 and 10:30 a.m. During summer months there is one service at 9:30 a.m. Also, starting the Sunday after Christmas and continuing through the third week in January, there is a single service of worship at 10 a.m. Special services are held at special times on Thanksgiving Eve (7:30 p.m.), Christmas Eve (Candlelight Services, 7 and 11 p.m.), Ash Wednesday (7:30 p.m.), Maundy Thursday (Table Communion, 7:30 p.m.), Good Friday (12 noon), and Easter morning (Sunrise and Mid-Morning Services, 7 and 10 a.m.) During the Lenten season there are brief mid-week services prior to educational programs. Other worship highlights for our congregation are Rally Sunday, which returns us to a two service schedule, on the Sunday after Labor Day; World-Wide Communion Sunday, observed on the first Sunday of October; Reformation Sunday, honoring the memory of Martin Luther and other Protestant reformers, held on the last Sunday of October; Totenfest or Memorial Sunday, remembering all church members who have died over the past year, held on the first Sunday of November, following All Saints' Day; the Cradle Roll Service recognizing all infants who have been born in our congregation during the past twelve months is held on the Sunday of Mother’s Day; Pentecost, which usually coincides with the last Sunday of May or the first Sunday of June; and Baccalaureate/Promotion Sunday, honoring recent graduates, observed the second Sunday in June. On Memorial Day and Fourth of July weekends, the American flag and the Christian flag are carried in procession to the front of the church to mark the significance of both national holidays. Both the 9 and 10:30 a.m. Sunday morning worship services at St. Paul United Church are similar. Yet some variations are noticeable. The 9 a.m. service is somewhat more traditional and formal. Worshipers are asked to refrain from applause after special music. Our pastor robes for the service and preaches from the pulpit. In contrast, during the 10:30 a.m. service, the sermon is sometimes delivered from the center aisle of the sanctuary. Because the second service coincides with the Sunday School program, a special "Family of God" time for children and families is offered during 10:30 a.m. worship on the third Sunday of each month. Children join their parents in the pews for the first part of the service before becoming called to the front of the sanctuary for the "Small Talk" time. As their special time finishes, they head upstairs for their Christian education classes. Our church practices an "Open Communion" for adults who have been baptized. All who desire to be at one with Christ are invited to receive communion. Church membership is not a requirement in order to participate in the sacrament of communion. In our own church tradition, young people are invited to join with us for communion after their confirmation in faith, usually at age 14 or 15. 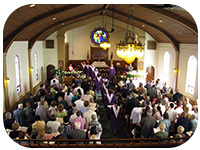 Pew communion services are held six times a year at both 9 and 10:30 a.m. worship. Altar communion is offered on the first Sunday of each month. More information about our communion tradition is available in a separate brochure, Questions and Answers about the Sacrament of Holy Communion. Other brochures are available in the church narthex and on-line regarding baptisms, weddings, and memorial and funeral services within our tradition and local church setting. Rehearsals for the Hand Bell / Hand Chime choir is held on Wednesday evening before the Chancel Choir rehearsal under the direction of our Director of Music, Tracy Hoffman. The Children’s Choir rehearses on Sunday mornings immediately after the 10:30 a.m. service under the direction of our church Organist, Sally Sigman. Rehearsal times are published in the Sunday morning bulletin. New choir members are always welcomed. Please speak with our Director of Music, Tracy Hoffman, if you are interested in participating in our music program. St. Paul United Church of Christ seeks to be a church for all people. With this in mind, our church installed an incline access ramp at our front entrance in 1982 and on the east side of our church in 2016.. Interior doorways have also been widened to make our building as barrier free as possible. In addition, our church has expanded the number of handicapped spaces available in the parking areas closest to the ramp and the front doors of the church. A wheelchair is kept on hand in the narthex for those who need to make use of it during the service. Our ushers are always available to assist those who require help in entering or leaving the church on Sunday mornings. You may wish to call in advance 313-291-1221 to ask the church ushers to meet you in the parking lot to lend a hand with a wheelchair or a walker. Our church also seeks to meet other needs by providing assistive listening devices and large print hymnals and orders of service. As you arrive at church, please let an usher know your particular need so that it can be accommodated. © 2018 St. Paul United Church of Christ.